Nebraska Carries Out 1st Execution Using Fentanyl In U.S. A federal three-judge panel denied a drug company's request to halt the execution of Carey Dean Moore over concerns about whether the state obtained the drugs improperly. Convicted murderer Carey Dean Moore did not put up a legal challenge to the execution protocol. Moore, who has been in prison since 1980 after he was convicted in the murders of two taxi drivers, did not put up a legal challenge to the execution protocol. He had seven other execution dates before this one. 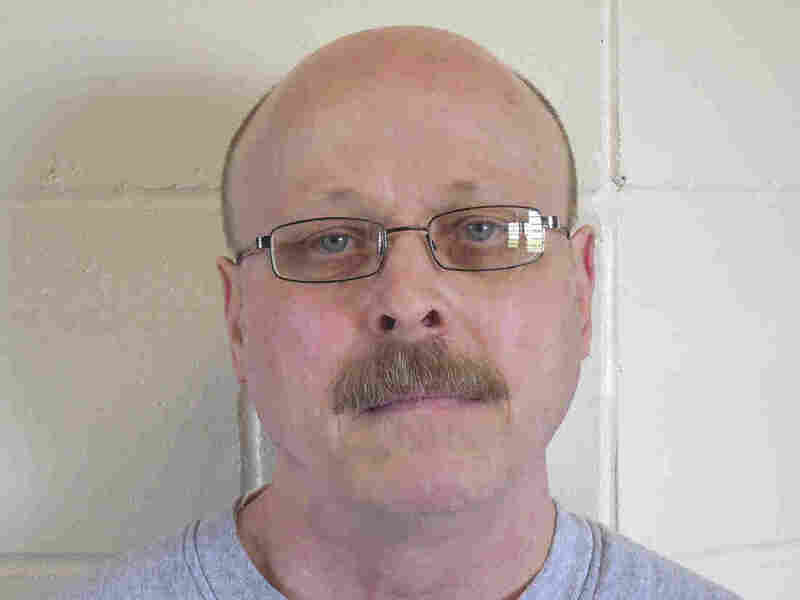 The first drug was administered at 10:24 a.m. local time, and Moore was pronounced dead at 10:47 a.m., according to the Nebraska Department of Correctional Services. "Witnesses said that there appeared to be no complications in the execution process," The Associated Press reported. "At one point while on the gurney, Moore turned his head and mouthed several words to his family, including 'I love you.' "
The execution was criticized by the ACLU of Nebraska. "This execution of Carey Dean Moore does not comport with Nebraska's proud tradition of open government," Executive Director Danielle Conrad said in a statement. "Today stands as the most recent dark chapter in Nebraska's troubled history with the death penalty." Nationwide, an increasing number of pharmaceutical companies have taken legal action against states that use their products in executions, making it increasingly difficult for states to obtain the drugs. The primary legal challenge to Moore's execution came from German pharmaceutical company Fresenius Kabi, which makes potassium chloride and cisatracurium besylate, two of the four drugs in the protocol. In court documents, the company said it does not take a position on capital punishment but worries that the use of what it believes to be its products in executions could do damage to its "reputation, goodwill, and business relationships." It's worth noting that the state has not disclosed its supplier. Fresenius Kabi said it has "grounds to believe" that these are its drugs. The company said that its products may be sold only by authorized dealers and that they have "contractually agreed to particular constraints, such as excluding sale to federal or state incarceration facilities." In a court filing, the state's lawyers point out that Fresenius Kabi's lawsuit is the only reason it is publicly linked to the drugs. On Friday, a federal district court judge denied the company's request for a temporary restraining order, which would have halted the execution. Judge Richard Kopf said the company's claim that the drugs' use would cause it "irreparable injury" was "far too speculative." The company quickly appealed, and on Monday, a three-judge panel of the U.S. Court of Appeals for the 8th Circuit agreed with the lower court's ruling, paving the way for the execution to go forward. The state had said in a court filing that the drugs "were obtained from a licensed pharmacy in the United States and were not obtained by any fraud, deceit or misrepresentation." That was after a long search, the court filing states; the director of the Nebraska Department of Correctional Services "contacted at least forty potential suppliers and six other states." The unnamed supplier was the only one willing to sell Nebraska the drugs, the state said, but is not willing to provide any more. 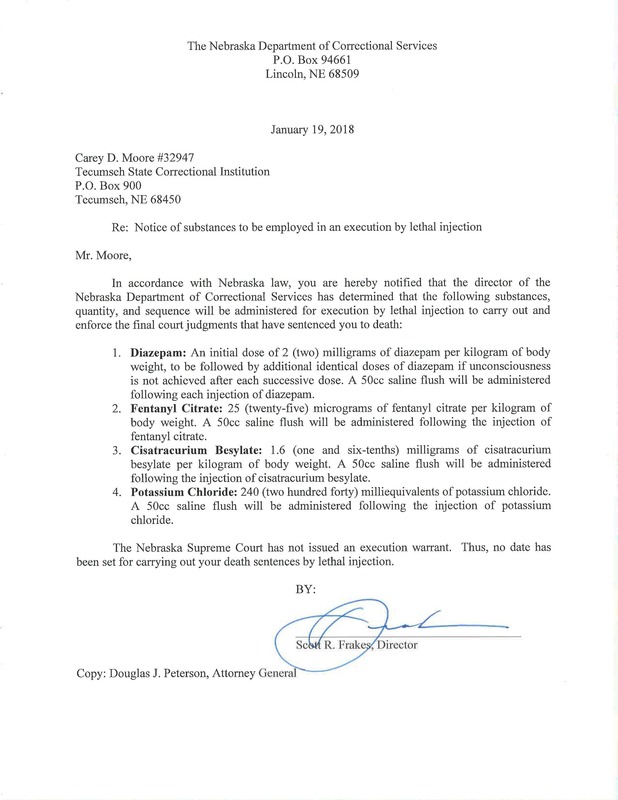 One of the drugs expires on Aug. 31, so Nebraska had argued that any delay could render it unable to carry out executions indefinitely. Some death penalty opponents have raised concerns about cisatracurium besylate, "which brings on paralysis, fearing if something was amiss and the substances resulted in 'tortuous pain' the paralysis would make the subject unable to respond," NET News reported. Tuesday's execution marked the first time Nebraska executed an inmate using lethal injection — its last execution, in 1997, used an electric chair. In 2015, state lawmakers voted to abolish the death penalty. Gov. Pete Ricketts then "helped finance a ballot drive to reinstate capital punishment after lawmakers overrode his veto," as The Associated Press reported. Ricketts "contributed $300,000 of his own money to a petition drive organized by several close associates to place the issue on the November 2016 general election ballot," AP said, and voters approved the measure. Nevada had been set to be the first state to use fentanyl in an execution last month, until a judge put the execution on hold because of concerns about one of the other drugs in the cocktail. At the time, Death Penalty Information Center Executive Director Robert Dunham suggested that fentanyl was a strange choice for an execution drug. "It's somewhat ironic that at the same time that the Justice Department and states are talking about how dangerous fentanyl is and how it's created a national public health emergency that states are now turning to it as a supposedly safe way of killing prisoners," Dunham said.